Merry Christmas, Jillian! To you and your family, including Hobbes. Our Dude is the Christmas story of the year this year. My mother thinks she’s ready to be a cat owner again, so we all decided to get her white elephant, er, cat, gifts. Well, Dude’s not THAT curious, so I went ahead and wrapped the catnip toy for Mom and put it under the tree. After all, he hasn’t ripped into the catnip toy with HIS name on it. Do you think he could leave this one alone, though? Nosireee! We found him laying on top of the cardboard cat scratcher,the wrap AND the cardboard ripped to shreds, and the catnip bag pulled out and opened. Merry Christmas to you all as well Laurie. I love, love that story about Dude. Just like a cat to be persnickety and unpredictable. I can picture it. Heheheh. Have a wonderful day surrounded by love and peace. Thanks for your friendship. You, too, my friend. Oh, and one addendum. My mom deciding to get a cat is HUGE and a Christmas blessing for us. She lost her Henry (cat) over a year ago and, at 89, thinks she’s too old and will saddle one of us with a cat one of these days. (Something we are all FINE with.) 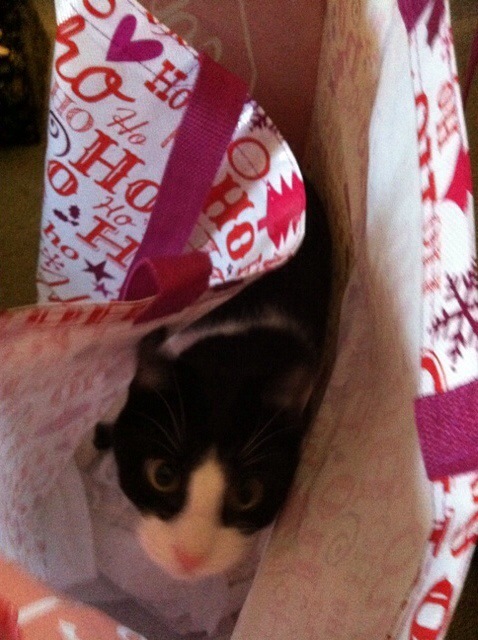 Anyhow, it took a year, but she misses having a kitty around, so we’re going shopping for an older cat after Christmas. SO excited for her! That’s so wonderful. I love that she’s made that decision. They bring so much joy that I know she’s going to love whomever picks her. As we all know, cats pick us, not the other way around. Post a picture of the new family member when the adoption happens. Wonderful idea, Laurie.Merry Christmas to you and your family.I’ll be looking for the story, too. Hobbes put a HUGE smile on my face! We had a Cat Christmas miracle last night…the new gal and the one we already had actually PLAYED last night,(around my big wool coat , but I was ready to sacrifice it).It was a peek-a-boo, slap-in-the face a few times, but it was the first no fight contact.We’re getting there. I hope you and yours have a WONDERFUL Christmas! Yay for kitties getting along. Merry Christmas indeed! Hope yours is wonderful,, too. It must be the season because Rue decided to show a playful side we don’t usually see. She gets bored with toys but a feather one fell off the top of the fridge and she was tearing it apart in the wee hours of Christmas morning. Hobbes certainly displays his fun loving personality. Laurie loved your story of Dude. Rue loves catnip. I read that it is for them like alcohol is for us and watching Rue I can believe it. By the way if your mother is looking for a cat think about making a trip to Olympia. I used be involved with Feline-Friends and am friends with the lady that started and runs it. If you let her know what you want she will keep an eye open for one. Their web-site is at http://feline-friends.net Elise and I did their websites so have been pretty involved. Sounds like Rue got into the spirit, too Lavada. I love the antics of kitties. Hobbes got some catnip toys from my sister and he romped around with thm for hours. LOL – They do like the nip. Merry Christmas to you!